I have been very busy the past several weeks. In times like this, verses like this one are just what I need to hear and meditate on. My thoughts are below. Looking forward to your contributions as well. My shoulders are sagging, my arms aching, my knees buckling. So very, very tired. The task before me is enormous. The result is far from sure. I have made but scant progress. The weight of this battle is heavy on my back; heavy on my mind; heavy on my heart. But I must plod forward. It is the work I must do. I lift my arm. It falls back to my side. I place my foot out. It falls to the ground once again. I crumble to the floor and weep. I can't do it, Lord. I wrinkle my brow. You KNOW, Father? Yes, My child. I know you can't do it. I lift my eyes and arm to the heavens. Then why have You put me in the middle of it? Because, My child, while you cannot do it, I can. When you work on your own power, you work against me. You must stop striving and let Me do the work. The LORD will fight for you; you need only to be still. Tears well in my eyes. Yes, Lord. You do it. I will be still. I will rest in You and allow Your power to accomplish what I cannot. Good, My child. For that is the only way you will win this fight. Yes, Lord. How I wish I had known this sooner. So do I, My child. So do I. Thanks for reading! Be sure to link up below with your own thoughts, and/or read the other folks' contributions. Blessings to you! Good morning, Joanne. Excellent verse. Made me reread a familiar story in greater depth. Thank you! 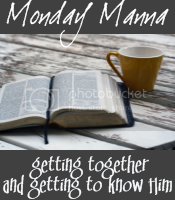 I'm new to Monday Manna...but I'm so excited I found the Meme. I was very encouraged by your thoughts. Yep, I fall into that all the time, trying to "help" God with the battles in my life. I'm learning. Thank for this verse. I needed it today. Jo, this post touched my heart so much. One of my favorites of yours, perhaps becuz of all the shaking up God is doing in my life. It has been so evident that He has fought for me, and I want to give Him glory for it each and every day. LOVE it. JoDear, this is so accurate of what's going on in my heart these days. This Scripture speaks to me every single time I read it--thanks for this piece. It's spot on and I needed it. how neat! love the WFW! god bless!